We are proud to introduce the Fjords Miami Manual Swing Relaxer small. Fjords is renown for creating furniture that is affordable, comfortable, and durable. The Miami recliner can swivel a full 360 degrees, rock and recline with the simple pull of a lever. The Miami is available in a wide variety of leather and fabric types and colors. To view the leather and fabric types and colors, simply use the pull down menu above, which is titled: "Select Leather or Fabric Type and Color." Once a leather or fabric type and color is chosen, the price of the Miami will change and a large color swatch will appear over the picture icon. Having a Fjords Miami Swing Relaxer delivered into your home has never been easier with our white glove delivery service. In most areas in the continental U.S., this service is included (if you select this service at checkout), which means that the delivery team will call to setup a delivery appointment, bring the Miami Swing Relaxer into your room of choice and remove all of the packing materials with them as they leave. 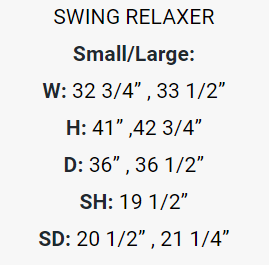 Still have questions about the Miami Swing Relaxer or other relaxing Fjords Swing Relaxers that are available on our site? Simply call 888-486-9463 or click the chat button on this page to speak with a Fjords Furniture Specialist. They are available to answer all questions and help find the perfect leather or fabric type and color and style for any home, office, or living space. Looking for a leather or fabric type and color that is not listed on the pull down menu above? Fjords is constantly updating the colors that are available. Let us help you find the perfect color!